GSOC Meridian Canadian Open kicks off in North Battleford, Sask. After a few quiet weeks over the holidays, curling fans everywhere have been itching to see their favourite game on TV again. They’re in luck, as this week’s Meridian Canadian Open gets underway in North Battleford, Sask. With the holidays officially over, it’s time for Canada’s competitive curlers to get back to work. It wasn’t quite a Christmas miracle, but there’s no doubt Reid Carruthers will be returning home for the holidays with a little extra joy in his heart … and a bit more cash in his pocket. 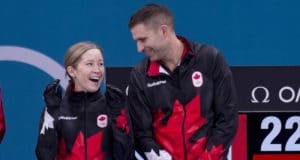 While most of the competitive curlers are ready to settle in next to a fire with a cup of eggnog for the Christmas break, a few Canadian teams are still on the far side of the world, chasing victories, money and points on the World Curling Tour. It’s not how you start, it’s how you finish The famous sports axiom might be a perfect mantra to sum up the year for Ottawa’s Rachel Homan team. Just two days after winning the Home Hardware Canada Cup with a spare in the lineup, Brad Jacobs was back his winning ways, albeit with a different spare, and about 5,000 kilometres away. 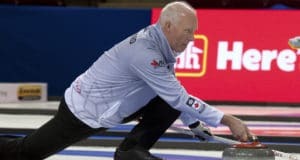 As the weekend began, Glenn Howard joked that he wasn’t sure if his team would let him play in the NISSAN Curling Classic in Paris, Ont. Team Howard back intact in time for Tour stop in Brantford, Ont. Scott Howard won his first World Curling Tour event as skip just two weeks ago. Who knows how long it will be before he has another chance? Scottish teams cash in at WCT stop in Penticton, B.C. It was a big week for Scottish men’s curling. Just days after Scotland’s Bruce Mouat won the 2018 La Gruyere European Championship in Estonia, two more Scottish teams met in the final of another major event on the World Curling Tour. Edmonton’s Brendan Bottcher was looking for his third championship at the Red Deer Curling Classic, but Saskatoon’s Kody Hartung played spoiler in the final, downing the defending champions 7-6. Not too long ago, the top-tier curling schedule was just a list of where you could see the best four-player curling teams in action on a given weekend. These days, it’s a bit more varied, and that’s a good thing. By the standards of most other teams, Team Rachel Homan and Team Brad Jacobs are both having pretty good years. Both squads have qualified in almost every event, and have reached semifinals and finals in big events all year. 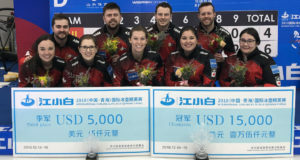 Homan even won her first event of the year, the World Cup of Curling in Suzhou, China. 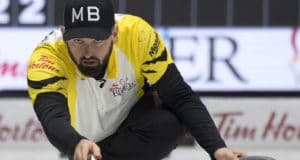 After a relatively quiet week on the World Curling Tour, the top teams are back in action at the Grand Slam of Curling’s Tour Challenge in Thunder Bay, Ont. Team Galusha commitment pays off with Tour win in Kemptville, Ont. 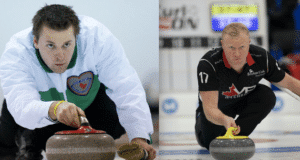 For teams playing out of the Territories, the prospect of being elite level curlers on the World Curling Tour can seem daunting. Each competition is a flight (or multiple flights), and a day of travel away. Those flights aren’t cheap, and neither are hotels, meals, and entry fees. The conundrum is made worse when you lose out of the event without any winnings to cover any of the costs. Although many of the top teams aren’t playing this weekend, it doesn’t mean that things are all quiet on the World Curling Tour.